1. Find the right shovel. 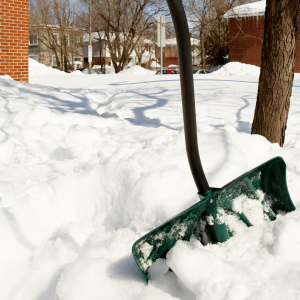 Your shovel should have a sharp blade, which will allow you to move the largest amount of snow efficiently. It should also be lightweight and have a curved handle, which will lessen the degree to which you are bending forward, thus decreasing the strain on your back during lifting. Never underestimate the weight of snow, as it’s often heavier than you think. Only lift when necessary; instead, push the snow off to the side. Avoid throwing snow over your shoulder and twisting while holding a heavy load. 3. Use your knees, not your back. Always bend at the hips and knees, never your back. Overextending your upper body is a sure way to hurt your lower back muscles. Clenching your ab muscles and lifting with your legs gives you the power and stability in your core that is needed to carry heavy weights. Although you may not think it’s as intense as running a marathon or playing a fast-paced sport, snow shoveling is rigorous exercise. It’s important to always warm up properly before participating in any physically demanding task, snow shoveling included. Cold muscles are more susceptible to injury; warm them up with some light aerobic exercise and gentle stretching. Be mindful of your body. As with all heavy lifting and intense physical activity, it’s critical to take frequent breaks. Stop shoveling if you experience pain in the back and chest or start feeling short of breath or dizzy. Here’s wishing you a winter of safe shoveling! Whether you’re suffering from back pain from shoveling snow or you experience recurring back issues, CHIROSMART is here for you. With quality care at affordable prices, we want to help you feel your best! Contact us today to schedule an appointment at 309-808-3260 or visit us online for more information.